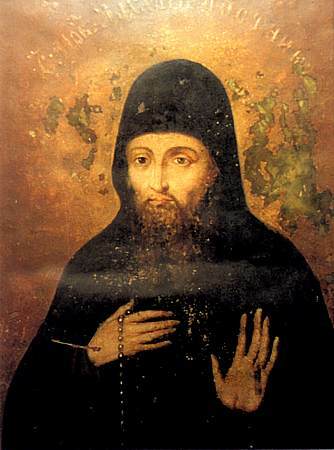 The Monk Zakharii the Faster, of Pechersk, pursued asceticism in the Farther Caves in the XIII-XIV Cent. The strictness of his fasting reached such an extent, that he ate nothing baked nor boiled, and he consumed only greens (grasses) – and this only once a day at the setting of the sun. Demons trembled at the mere mention of the name Zakharii. Often the monk saw Angels, with which he merited life in Heaven. The identification of the monk Zakharii, Faster of Pechersk, with the son of the Kievan inhabitant John – Zakharii, who had given all his inheritance for the adornment of the Pechersk temple and become a monk at the monastery, – is unfounded. John before death had transferred his property for maintaining to his friend Sergei. This was during the time when the hegumen was the Monk Nikon (+ 1088, Comm. 23 March). Zakharii at the time was 5 years old. At age 15, that is – not later than the year 1098, he obtained his inheritance from Sergei, in order to give it to the monastery. However, the monk Zakharii – Faster of Pechersk, lived approximately 200 years later.